You will find here a brief introduction to our churches. Click on the links to find out more in depth information about each church. We hope you are able to come and visit them in person soon. A warm welcome awaits! In 2017 the three benefices of Irfon Valley, Blaenau Irfon and Upper Wye were officially amalgamated into the Irfon and Wye Ministry Area. Many of our churches have been built on very ancient sites which have been centres of worship and spirituality for centuries and we are keen to keep them open for private prayer and other appropriate uses. Following the Celtic pattern, they tend to be set apart from population centres with beautiful churchyards, stunning views and a very spiritual spirit about them. You are very welcome to visit these quiet, unobtrusive and spiritual treasures whether you are new to to the area or have lived here all your life. Three of the buildings are Grade 2* listed buildings. 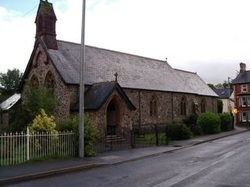 Blaenau Irfon - St James, St David's and Eglwys Oen Duw. St James, Llanwrtyd is a different kind of church. In the middle of this little town, it is a centre of community activity and a friendly and unpretentious place to worship. It is also open during the day where it provides a beautiful, quiet space, good facilities and some attractive works of art. St David's, Tirabad is an interesting little Georgian church (the only one in Brecknockshire) in a beautiful and remote settlement. It is need of repair. The front porch has now been removed for safety, but the occasional services here are a very special experience. Sadly, St David's is now closed due to deterioration of the building fabric. There are also two churchyards in the equally remote Abergwesyn. Both of these are in exceptionally beautiful locations on either side of the river Irfon, but particularly worth a visit is Llanfihangel with its listed Celtic cross and splendid yew trees. A truly spiritual place. Beyond Abergwesyn, off the Tregaron road, is Soar y Myndd a well known nonconformist chapel deep in the mountains. St David's, Llanwrtyd (the Old Parish Church) is the oldest of our church buildings and has a breathtaking setting in the valley of the Irfon. It is very popular for weddings and when you visit it, it is easy to see why, with its simple design, attractive churchyard and many interesting features including a striking, larger than life-size carving of St David. It opens in the summer months but accommodates a thoroughly atmospheric, candle lit (there is no electric supply) Christmas Carol Service which attracts a congregation which packs the little church to capacity drawn from all over the double benefice. Eglwys Oen Duw, near Beulah is a very different building, built in Victorian times as an estate church in an elaborate Gothic style, which is unusual for rural Wales. It has recently aquired a sensitively designed new annexe which makes it both beautiful and useful. EOD is a shining jewel in a lovely setting. Look out for the pretty footbridge which is also listed! Irfon Valley - St Cadmarch's, Llanganten, Llanlleonfel and Llanfechan. St Cadmarch's, Llangammarch is often thought, even by local residents, to be a very ancient church but in fact, it was built in 1919 in the Arts and Crafts style. It is certainly a beautiful building with a modest unity of design which is calming and attractive, but what is perhaps most stunning is the view coming out of church on a sunny Sunday morning with the Epynt in all its wild glory above the gently rolling Irfon Valley. Unmissable. The Parish Church, Llanlleonfel, Garth, known as the church where the great hymn writer Charles Wesley married Sally Gwynne in 1749, is perhaps the most mysterious of Irfon Valley's churches. Built on a hill outside Garth, it isn't easy to find but is well worth the effort with many interesting features and a very special tranquil feel. Sitting quietly here you can enter into a different world. Llanfechan (St. Afan's), Garth is a quirky reminder of a previous age. Nestling next to a farmyard beside the main road it has a splendid display of daffodils in early spring, fine old yew trees and a lovely unique take on Anglican worship! It is the daughter church of Llanafan Fawr, not in our benefices, but another important ancient site not far away on the Beulah/Newbridge road with one of the most splendid yew trees in Wales. Llanganten (St Cannen's), perhaps with Llanlleonfel, wins the award for the church most difficult to find, hidden away as it is behind Cilmery, but it has a lovely setting beside the Chewfri stream and, for this writer at least, is the perfect country church: tranquil and with a spirit of simple holiness. It also has historical associations, from a fiercer time, with Llewelyn the last native Prince of Wales. Upper Wye - Newbridge, Cwmbach Llechrhyd, Llanafan Fawr and Llanfihangel Brynpabuan. Victorian church designed by Stephen Williams and built in 1883, at the expense of the Venables family. 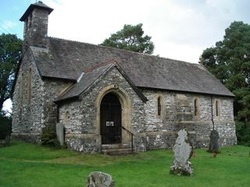 St John the Divine, Cwmbach Llechrhyd. 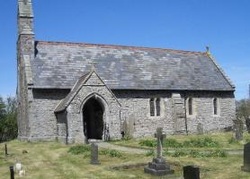 The Parish Church of St. John was built in 1886 at the expense of Miss Clara Thomas of Pencerrig and cost £12,000. Between 1886 and 1962 there were 3 vicars but after 1962 St.John's was grouped with Llanelwedd, Llanfaredd, Llansaintfraid, Cregina and Bettws churches, all sharing one vicar, residing in Llanelwedd Rectory. Regrouping in 1984 meant that St. John's joined Newbridge, Llanafan and Llanfihangel-Brynpabuan sharing one vicar who lives in Newbridge-on-Wye Vicarage. 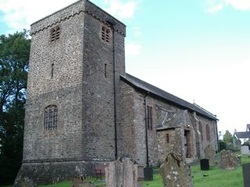 The Church of Saint Afan has been rebuilt several times. The foot of the church-tower is the only part remaining of earlier construction, the rest being rebuilt in 1886. In the porch on the right-hand wall are several carved stones which date from the 7th to 9th centuries. Inside the church, to the left of the altar, is a single pillar stone incised with a Latin ring cross, dating from the 7th century. To the right is an ancient baptismal font of similar age. There is a 2,200-year-old yew tree in the churchyard. 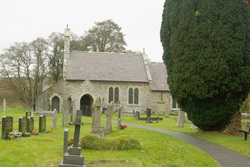 The churchyard claims Saint Afan's relics and is also the burial place of Thomas Huet, who translated the Book of Revelation into the Welsh language in the 16th century. St Michael and All Angels, Llanfihangel Brynpabuan. 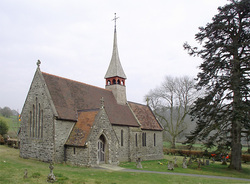 Restored in 1861, parts of the church date from the 13th or 16th century including arch braced roofs in both the porch and church. There is a small, low level window on the south wall, possibly a lepers' window(?). On the B4538 situated between Newbridge-on-Wye and Llanafan on the inside of a slight bend, it is easy to miss the entrance.